Here is a great collection of some of the Best Free Bird Images, and Bird pictures to print, from here on The Graphics Fairy blog! 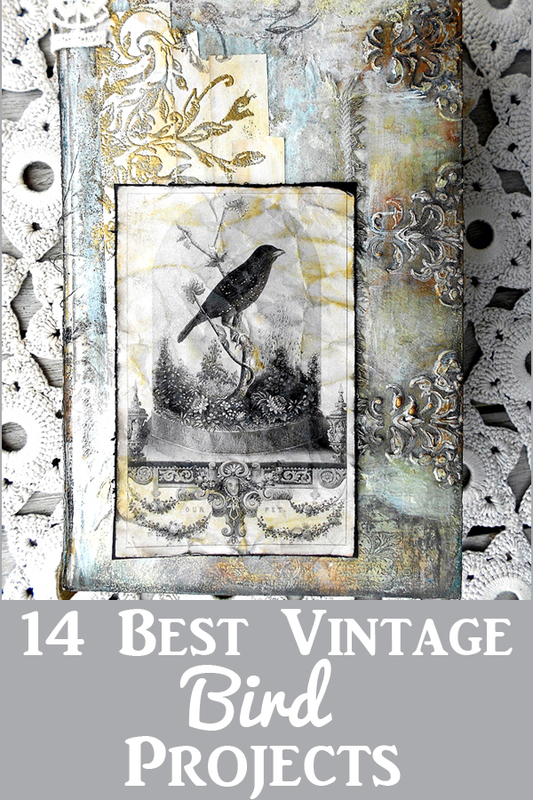 The bird archives at The Graphics Fairy are extensive and it was difficult choosing a few favorites for this post! 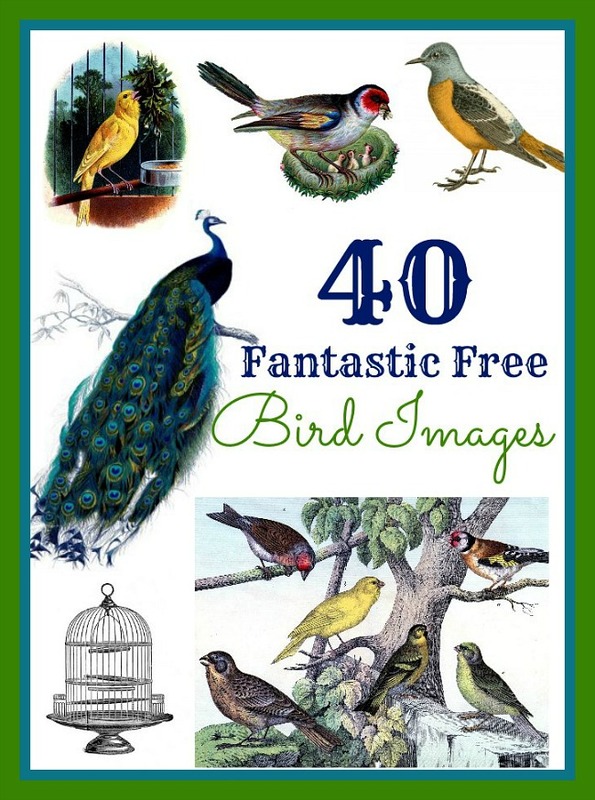 In this post, you’ll find 40 links to our favorite birds, organized by wild birds, pet birds (and cages), exotic birds, nests and eggs. These images rage from antique scrap pieces, to drawings and Illustrations, and natural history prints and printables, and are perfect for your craft and digital art projects. 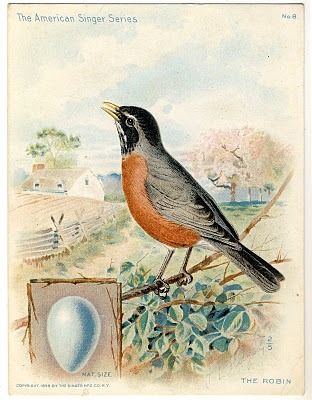 A wonderful vintage trade card, circa 1899, features a robin perched on a branch looking out over a farm scene. She has a bright orange belly and there is also an image of a Robin’s egg in the lower left hand corner. These four little fluffy blue gray birds on a branch, just couldn’t be any sweeter. The original painting was done by Parisian artist Hector Giacomelli, who was known for his beautiful Bird Art pieces and illustrations. 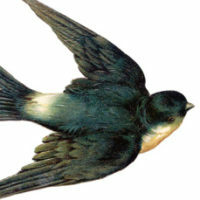 I love this image because you usually see a swallow print with them mid-flight. This image is of two swallows perched on a branch, one with a red belly the other has a white one. 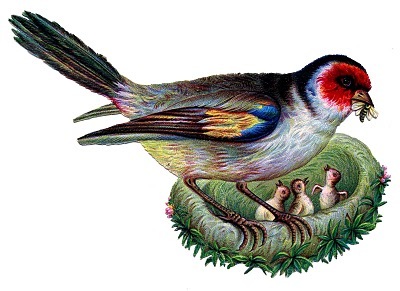 This lovely Vintage Bird Image is from a Circa 1860 Natural History Print! This old engraved illustration appears to be hand colored. He has a gorgeous yellow gold belly and tail and his head is a beautiful shade of gray green. This owl is perched on a stump and is leaning over like he is getting ready to swoop down and catch a mouse. This antique print is from 1870. The print is labeled “white owl”, and he looks similar to a barn owl with a white face and pretty shades of tan and grey feathers. The Citril Finch is a wild version of the domesticated canary. This image was scanned from a Circa 1879 Natural History Bird print, and is a lovely hand colored engraving. He has a Yellow belly and greenish yellow feathers on his back and head. This one is a bright blue jay, standing on a branch in this old Arm & Hammer trading card. I love the bright blues and grey tones in his feathers! This one is a German postcard with swallows on it. The swallows have a variety of poses, sitting still, flying, about to take off, and singing on the line. The original version is in color, but I’ve changed it to black and white and played with the birds to get a few more on the line, and also am offering a blue version too. A 1917 nature book image of a snowy owl, with piercing yellow eyes, looking back over his shoulder. The owl stands in his natural landscape of snow, and has pretty blue and grey tones to it. This is an adorable scrap piece with a mama bird feeding her babies in a nest. The mom has a bright red face and has a bug in her beak. The mossy nest has three tiny birds inside with their mouths open, ready to eat! This charming old French postcards shows two swallows on their nest. A red heart with an arrow through it and a lovely flowering branch adorn the card. A pretty blue cancelled stamp is in the upper right corner of the post card. A cute little Grosbeak bird is perched in a beautiful pink dogwood with a cute little nest with some spotted Eggs in it! This one was scanned from a darling Circa 1922 Children’s Bird Book. There is a little blank spot on the image for a message too! A lovely blue winged bird feeds his mate a worm in this colored drawing. The mama bird is sitting in a round next perched on a flowering branch. This post has two versions of the image, one with pink flowers and one with yellow flowers. This is a perfect vintage clip art with a lovely nest perched on a flowering branch. The nest has three perfect blue eggs in the nest. This one is a an early natural history print from 1808. This fabulous print features two Red Throated Hummingbirds, with their little nest and two tiny eggs. The birds are hand colored in shades of reds, blues, and greens. Here’s a wonderful bird’s nest with pretty blue Eggs from an Antique Natural History Book. The nest is perched on the branch of an Evergreen Tree, and would work well for winter or holiday projects. This print shows two darling Goldfinches, perched next to their nest. One of their tiny Eggs is illustrated underneath. This really pretty print has great color with bright yellow birds and pretty green leaves. 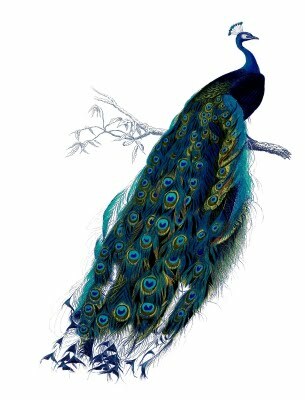 A regal blue and green peacock male sits on a branch in this lovely natural history image. This graphic would be wonderful on its own or layered with other graphics. A .jpg file with a white background as well as the original full size PDF has been included. One of the Best Peacock images that I’ve ever seen. This is a gorgeous antique print of a wonderful Parrot on a branch. The print was done by George Shaw and dates to 1811. The post includes the original sepia engraving, and a cleaned up black and white PDF to make some instant art! A lovely image of two pretty red and black birds perched on a branch with lots of leaves. Their feathers are a beautiful bright reds and whites against dark black wings. The Scarlet Tanager and Rose-breasted Grosbeak would be perfect for you to use in your Spring craft or collage projects. This post includes the original scanned version of an amazing pen flourished peacock. The feathers are so beautiful with various line widths and flourishes. I’ve included a black and white and turquoise and white version along with the original image for you. I love the the pretty pink feathers on this bird who is perched on a branch with his mate. The male bird has the prettiest tuft of black feathers on his head too! This gorgeous page of feathers comes from an old French dictionary. The page includes several images of the heads of exotic birds and their fancy plumes. I’m particularly fond of the Peacock feather and the Ostrich plume, so gorgeous! An antique history print, with a lovely roller looking over his shoulder. This hand colored image has such beautiful colors — bright greens, yellows, and blues. I love the sneaky expression on this guy’s face too! This vintage image comes from a 1901 book, and shows a Tanager on a wooden stand. I think the colors on this one are extraordinary – blues, yellows, greens, and orange! The antique scrap piece includes a fancy gold bird cage with two charming yellow canaries and a nest with four eggs! One of the bright yellow canaries is on a perch singing, while the other bird is sitting on her nest. This fantastic bird print, circa 1879, shows six lovely colorful birds, including birds in the finch and canary families. The birds are perched on various branches near a fence post and are in leaning, bending, and standing poses. This is an exceptional antique birdcage image with two pretty birds inside. The birds are pretty shades of pinks, yellows, and blues white. The lovely scene in the background includes trees and a light blue sky. A pretty black and white natural history engraving of a cockatoo perched on a branch, looking back over his shoulder. This etching has beautiful detail on his feathers. This one is a marvelous antique Victorian bird cage with a rounded top. This image came out of an old bird supply catalog. Both the original (with sepia tones) and a cleaned up black and white version are included. A pretty print of a fancy dove or pigeon with hand colored black and white feathers. The bird’s body looks like a traditional dove or pigeon with a fancy group of feathers ruffled up on his backside. 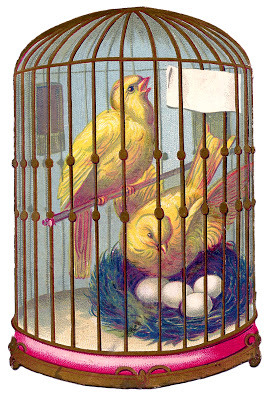 This image is from an old card with a bright yellow canary mid-song on a perch. This cute bird is shown in his cage with his little feeding dish. This darling parrot cage comes from an 1870′s hardware catalog. The black and white image includes the square shaped cage with a perch, swing and food cups. This amazing German print dates to 1843 and shows a variety of different types of Nests and Eggs in off whites, blues, and tans. I did some moderate cleaning up, but left some of the age marks, so that it will still look old when you print it out. Great for framing as it is, or wonderful for your Handmade Projects! This lovely antique plate has six hawk and owl eggs. I love this print because of all the varieties of egg shapes and colors (whites, tans, speckled, and blues) in this image. Wow! 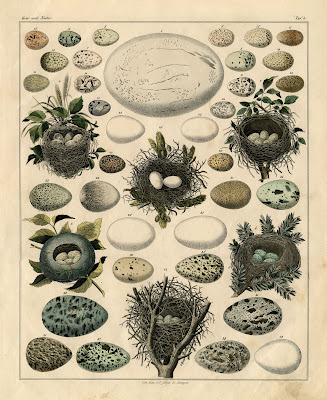 This is an amazing print of all kinds of bird eggs from an old circa 1900 encyclopedia. Pictured here are 24 different types of eggs, including wren, barn swallow and even hummingbird. This antique print was posted back in 2007 and features more hawk and crow eggs. The print has a nice variety of six eggs with brown speckles on blue and white eggs. A great collection of bird eggs grouped together in a natural setting among some grasses. The eggs are pastel colors – blues, creams, yellows, and greens. I love the broken egg on the side that looks like a bird just hatched. This egg print has a huge number of eggs, all displayed (sometimes overlapping) in a neat display. There are many eggs in browns, blues and whites, and speckled and non-speckled varieties to choose from on this one! We hope you enjoy these 40 Best Free Bird Images! This is just a small sample of the bird images available on the site, so be sure you browse through the extensive bird and eggs archive. Feel free to share your creations in the comments below or on our Reader Submissions page! Want some ideas for Bird themed Projects? Check out the post… 14 Best DIY Projects with Birds HERE. You’ll find loads of great ideas! « Super Pretty Free Pink Floral Graphics Set – 1940s-1950s! Saw you mentioned on Apartment Therapy and I had to say kudos to you. I was already in love with your site and now this bird post…thank you! I adore birds. That’s awesome! I love Apartment Therapy, thanks for letting me know! I’m glad you like the birds. J’adore les oiseaux! Merci Beaucoup ! I love these beautiful bird images – thank you so much, Karen! Your graphic images are fabulous! I don’t comment much but I really enjoy your site! These are awesome! Thank you so much for sharing these beautiful images. Every image/project you post is fabulous. But my all time faves are birds, french typography and flowers. I love your new series that compiles related themes/projects into one post. Thank you so much for all the gorgeous images and inspiration you provide every day to so many thousands of us. Thanks rk! I’m glad you are enjoying these posts! With so much stuff on this blog, we thought it would be useful to pull these themed collections together, to help everyone find the good stuff! Oh no! Its my kryptonite – I cannot resist a pretty picture of a bird! Thank you – I’ll have these plastered all over the house!